Famed trend forecaster Gerald Celente predicted in 2009 that a third party presidential candidate could win in 2012. It obviously didn’t happen. But could a third party win in 2016? Poll after poll shows that both mainstream parties are deeply unpopular with the American people. Poll after poll shows that the American people are disgusted with the core policies of both the mainstream Democrats and Republican parties, which help the fatcats while hurting the little guy. Polls show that Congress is less popular than dog poop, toenail fungus, hemorrhoids, cockroaches, lice, root canals, colonoscopies, traffic jams, used car salesmen, Genghis Khan, Communism, North Korea, BP during the Gulf Oil Spill, Nixon during Watergate or King George during the American Revolution. 60% of Americans want to throw all of the bums in Congress – including their own representatives – out in the next election. Eighteen percent of Americans are satisfied with the way the nation is being governed, down 14 percentage points from the 32% recorded last month before the partial government shutdown began. 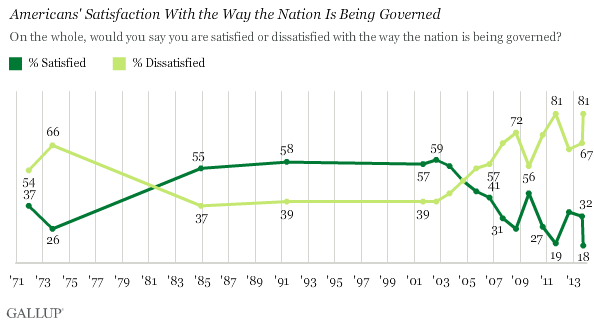 This is the lowest government satisfaction rating in Gallup’s history of asking the question dating back to 1971. Americans are finding little they like about President Barack Obama or either political party …. The AP-GfK poll finds few people approve of the way the president is handling most major issues and most people say he’s not decisive, strong, honest, reasonable or inspiring. Large majorities of those surveyed finding little positive to say about Democrats. The negatives are even higher for the Republicans across the board, with 4 out of 5 people describing the GOP as unlikeable and dishonest and not compassionate, refreshing, inspiring or innovative. 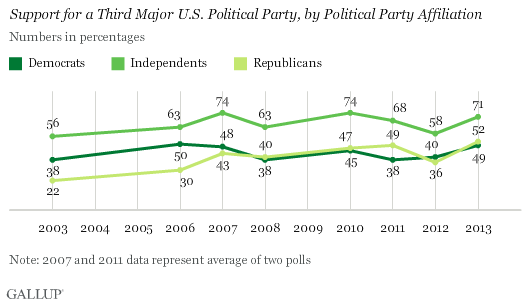 Republicans (52%) and Democrats (49%) are similar in their perceptions that a third party is needed. 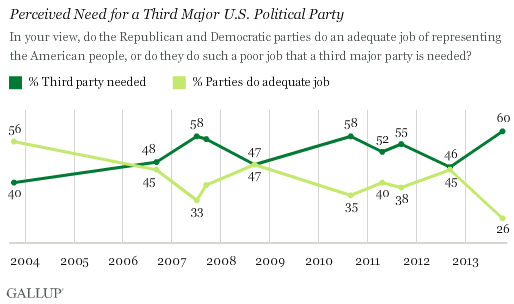 In fact, this marks the first time that a majority of either party’s supporters have said a third party is needed. The two-party system has become nothing but a scripted beauty contest between two sides of the same coin. We have a crisis in our dependence on two corrupted political parties, each paid to perpetuate a mass extraction on behalf of those that finance them in unique and sordid ways. [In the Internet era,] what is to stop five or ten political aspirants from running in open primaries using transparent financing, absent any political party whatsoever? What indeed, other than blatant stonewalling and subterfuge by the men and women of our two dominant parties who have established a ruling class in a nation that certainly doesn’t want one and absolutely doesn’t need one? But isn’t the American system by definition a two-party system … warts and all? No … in fact, the Founding Fathers tried to warn us about the threat from a two-party system.